STEPLets' introduces a clever new format just right for babies and toddlers beginning to explore their ever-expanding surroundings. There are: Sturdy, die-cut board book pages, graduated in size for a "what's next?" sense of discovery.Shaped pages for tactile reinforcement of concepts and words,Spot-on whimsical art to stimulate growing imaginations.STEPLets' are the perfect books for youngsters just stepping out into the world.There are ever so many critters--and ever so much fun--packed between each tip of the nose and each end of a tail on every spread of STEPLets' bright, new HEADS AND TAILS. And just whose snout is that peeking out waiting for the page to be turned? 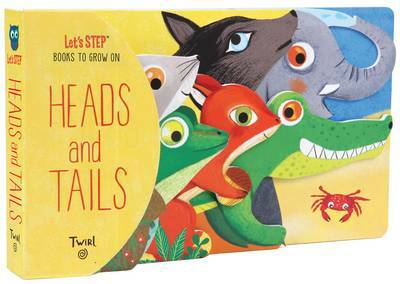 From heads to tails, it's a hands-on way to for kids to grow their understanding of the wider, and wilder, world!